availability of these substances in the aquarium environment. As the name implies, FlorinAxis benefits plants in a number of very important and interrelated means: it provides a stable source of carbon (derived from naturally-occurring compounds rather than from preservatives) for direct uptake by plants; it provides key components involved in the Krebs cycle, which enables all aerobic organisms in the aquarium to better utilize available nutrients; it provides humic substances that increase the bioavailability of multivalent cations (such as iron, calcium, magnesium, molybdenum, copper, manganese, zinc, cobalt, and nickel) important to plant health and growth; and it provides phytohormones, natural substances shown to increase the growth and flowering rate of aquatic plants. 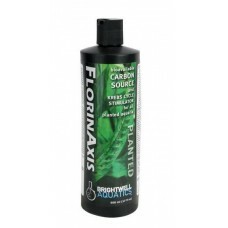 In essence, FlorinAxis is a unique, extensively-researched formulation that encourages increased health and growth of fishes and plants, as well as encouraging the rapid break-down of latent organic material by aerobic microbes, with the aid of well-documented principles of Biology; it can produce dramatic results in planted aquaria. Citric Acid and Citrate - Organic carbon source and a confirmed stimulator of the Krebs cycle; carbon is required for all organic compounds. Magnesium - Krebs cycle catalyst, component of chlorophyll, required for enzyme activation. Humic and Fulvic Acids - Promote nutrient uptake, stimulate root- and overall-growth, aid in photosynthesis, stimulate plant enzyme production. Kelp - Provides natural phytohormones necessary for plant growth and flowering. Protein Hydrolysate - A source of slow-release nutrients and soluble peptides and amino acids, the building blocks of plant proteins. 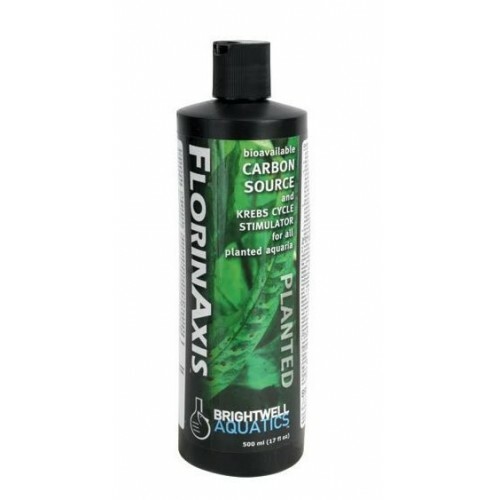 FlorinAxis will help create an environment conducive to long-term plant health and growth; it is part of a complete system for planted aquarium husbandry and is most beneficial when used in conjunction with supplements that provide other necessary nutrients. Water care products that provide a full range of nutrients, such as Brightwell Aquatics FlorinMulti, Florin-K, Florin-Fe, and FlorinGro, should be used as plant requirements in individual aquaria dictate. Shake product well before using. Basic: For the first 3 - 5 weeks of use, add 5 ml (1 capful) of product per 50 US-gallons (189.3 L) of aquarium water once each week; increase dosage thereafter depending upon perceived nutrient needs of plants. Densely-planted aquaria and/or those that enjoy rapid plant growth (such as aquaria with intense lighting and CO2 supplementation) may benefit from more frequent supplementation. When used in this fashion, 250 ml treats up to 2,500 US-gallons (9,464 L).